AutoCAD 2019 and AutoCAD 2020 Support! 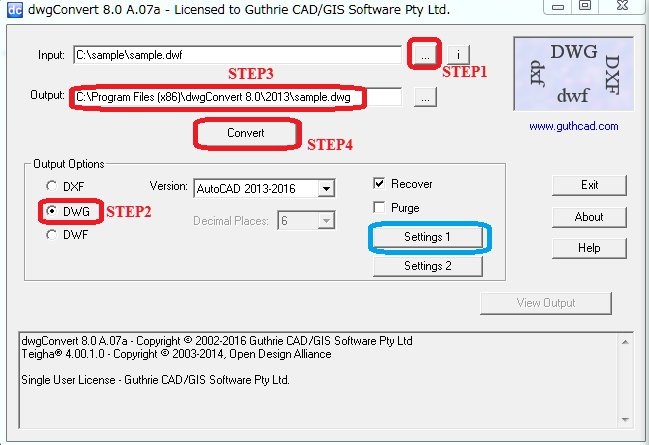 guthrie dwgConvert is a FAST and EASY DWF to DWG / DXF / PDF converter. So that you can instantly save DWF as DWG, DXF or PDF. This software does not require AutoCAD® to run. STEP 1. Select the DWF file. STEP 4. Press Convert Button. Then a new file will be generated as a DWG drawing in the selected Output file folder. If you click setting1 button and setting2 button, you can use many useful conversion features that other converter software does not support! Reads DWF versions 4.2, 5.5, 6.0 and writes all AutoCAD versions 2.5 to 2020. Intuitive User Interface - anyone can use it. Batch conversion is available from software interface and command line. Support to convert DWF to PDF. Find the full list of features of our DWF to DWG converter from here. dwgConvert converts DWF to DWG / DXF files with extra features that other converter software don't have. dwgConvert supports up to AutoCAD 2020 (DWF versions 4.2, 5.5, 6.0). Click the left button to view details of our DWF converter.